Receive a secret promo code on your e-mail. Your discount should already be there. 5% OFF YOUR FIRST ORDER. Writing essays is not easy even for talented poets and writers – working with a word requires from the author not only talent, but also a lot of attention and concentration. The main thing is not just to reveal the topic, but also to make it interesting, trying to grab the reader’s attention from the first sentence. The secret ingredient of the essay is structure. Owning effective essay writing strategies, you will not reinvent the wheel. In most cases, the student is required to introduce a topic, attach and support three plausible arguments and write a conclusion in the last paragraph. The following tips will tell you how to write a good 5-paragraph essay effortlessly. 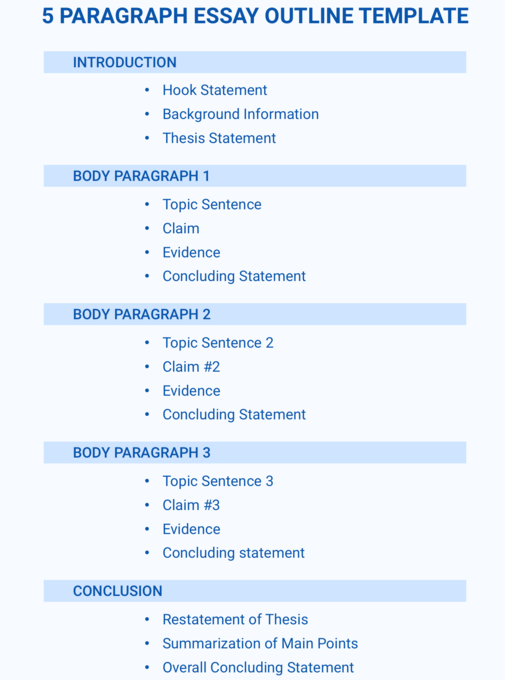 What is Five Paragraph Essay? 5-paragraph essay is a standard academic assignment that aims to test the skills, knowledge, and ambitions of a student or a schoolchild. This is an informative presentation with some descriptions of the selected thematic problem. The assignment allows assessing the level of student interaction with the audience. This type of work reflects the ability to protect own thoughts and theses. It improves analytical skills and trains research skills. Developed skills are necessary for passing tests for graduate students: TOEFL, SAT, IELTS, ACT. The student should argue and sum up the conclusion in one paragraph. 5-paragraph essay implies ensuring the relevance of the topic by the student. He must support the proof, using reliable data and information. It is better to format the work while writing. It is also better to leave some time for checking the paper for errors and plagiarism. How to write a 5 Paragraph Essay? A good essay cannot be written without a plan. It is necessary to formulate thesis, the main argument. Make sure that each paragraph relates to the topic of your essay. Looking at the outline, you are not distracted by minor details. Thus, the plan helps to focus on the essentials. Each type of essay has its own structural features, which must be carefully studied and known. It is important to “hook” the reader with the first sentences. It is necessary to let him know what awaits him in the work, and what he can learn. The paragraphs begin with a sentence that include strong argument and proof. Each paragraph contains a separate argument, which is a reference point for the thesis. The paper should include three arguments for or against the problem under investigation. These arguments must prove the thesis. Have the last sentence as a thesis. The hook may appear as a rhetorical question, an amazing fact, anecdote, quote, or real fact. Complete introduction of your essay with theses that will link together the three upcoming points. A clear thesis and a concrete list of facts and ideas will allow the reader to understand all the necessary information by the end of the essay. State your argument. Why are you sure that the topic sentence is correct? Provide evidence and proof (facts and statistics) that support your argument. Body paragraph is ready! The same should be done with the first and second point. It should be understood that the first paragraph provides a scheme for the body paragraphs and eliminates the need to create transitions between sections. Choose the best ideas related to the research problem. It is necessary to select the best parts, to provide three strong arguments. The last paragraph will be the final. You need to make transitional words to follow from the body to the last paragraph. The conclusion should reformulate the sentence. Think over the possible alternatives and offer predictions for the future. The conclusion is derived from the main paragraph. This is a generalization of the reasoning from the previous parts of the essay. Indicate in the conclusion only the most important statements. This section should not contain new ideas. Do not use quotes in this section. Complete the argument by listing all the proof in the final part of the essay. Here you can repeat in other words some of the arguments that you used earlier. You should know that the final part is your last opportunity to convince the reader of your reasoning, but do not include any new ideas in the end. Determine whether the points are strong enough to support each proof and thesis. Assessing appropriate and skillfully usage of transitional words between sections. Did the writer develop a correct plan and did he adhere to the necessary plan? Search for spelling, grammatical and punctuation errors. There is estimated success of vocabulary use, level of creativity and plagiarism. It is evaluated whether the writer was able to substantiate the argument and the topic of the work correctly, logically and briefly. In order to understand how to implement the listed requirements, look at the free examples of 5 paragraph essays. Now you can read and analyze an example of 5 paragraph essay written according to the proposed plan. See samples of work on various topics. We have collected the best papers so that you can get acquainted in detail with the structure and format of the work. You have something to say on the subject. Is it necessary to prohibit selling fast food in educational institutions? Is it necessary to cancel uniforms in educational institutions? At what age can the child be allowed to stay at home alone? Is it necessary to provide sleeping time for middle school kids? Why do we need a summer school? Is sports necessary as a school subject? How to regulate pocket money for middle school kids? Is it normal to force a child to do housework? What is the school newspaper worth about? How does violence in video games and movies affect the behavior of middle school children? How to prevent the extinction of rare species of animals? Write A Five Paragraph without stress! Writing a five paragraph essay is one of the most difficult tasks that students face. It is required to state your own opinion on a particular issue so that the scientific nature of the work is preserved. In fact, the author of the essay has to balance on the thin line between the artistic and scientific style of presentation. In addition, this type of assignment does not allow borrowing information from books, Internet, periodicals, etc. Only direct quotes are allowed, and then in very small quantities. Unhappy students who do not know how to accomplish this task, go to various tricks, for sample, downloading finished work on the Internet. As a result, they often come across plagiarism and get a great amount of problems with abuses or re-passes. 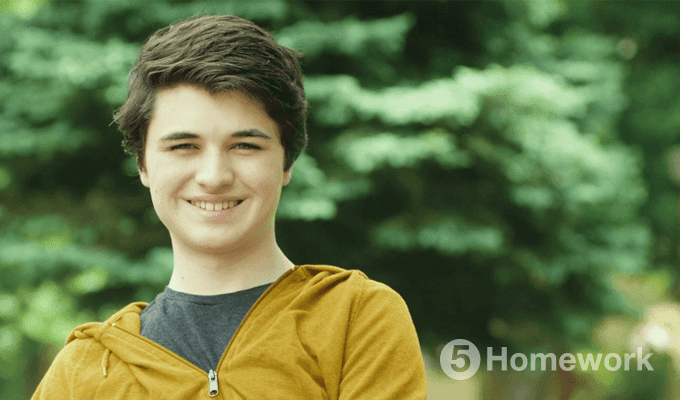 In this regard, 5homework.com is ready to perform a reasonable solution! We strictly keep the secret of cooperation between the agency for writing student work and the client. The ability to order an essay is affordable for everyone. The best experts provide an urgent format for solving problems and the most affordable prices for individual writing an essay. No risk – only 100% result! Stay tuned for the best 5HomeWork offers and bonuses! 539 professional writers active now. Choose one for your order. Copyright © 2008-2019 5homework.com. All Rights Reserved. will call you back soon.